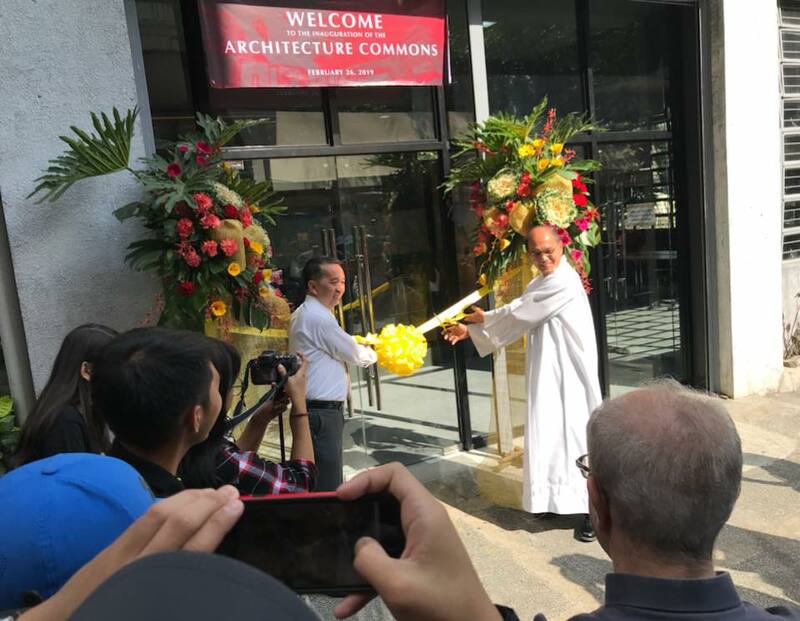 The UST Miguel de Benavides Library Humanities Extension (satellite library) was inaugurated last February 26, 2019. The opening ceremony was led by Rev. Fr. Manuel F. Roux, O.P., regent, College of Architecture, Arch. Rodolfo P. Ventura, college dean and Fr. Angel Aparicio, O.P., Prefect of Libraries. The Library is for the exclusive use of the administrators, faculty members and students of the College of Architecture. It has been established upon the urgent needs and request of the College as expressed by its dean. The Library is divided into two: The Architecture Library Commons and the Workshop. The Architecture Commons is located at the former printing press area, under Domus Mariae International Residence which has a seating capacity of 44 and consists of initially 749 printed books related to architecture and arts, all are for room use only. The Workshop is situated beside the UST Publishing House Office which has drafting tables and can accommodate 60 users. Both areas are air-conditioned and open from 8:00 a.m. to 8:00 p.m., Monday to Saturday. The rest of the books on architecture are available at the 5th floor Humanities Section, Central Library Building. 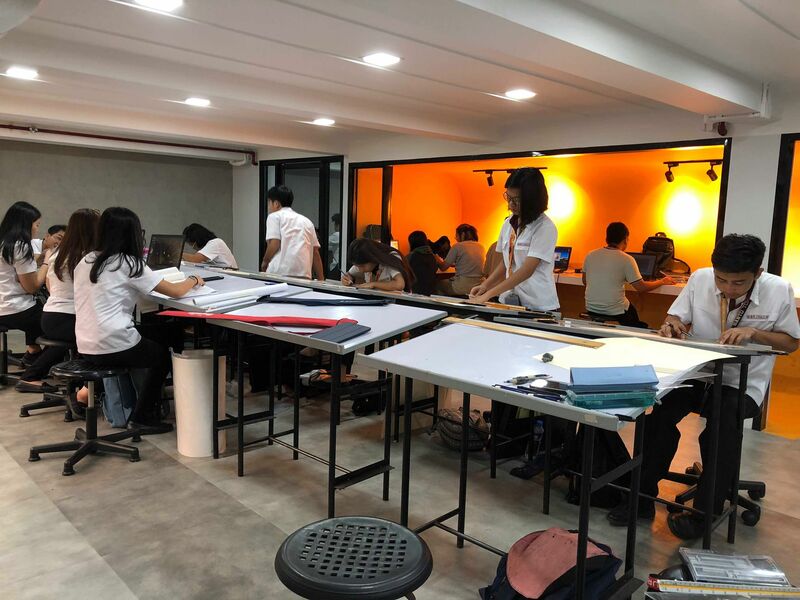 The UST Library and the College of Architecture are working together to maintain and improve its facilities and to provide an effective library service to its target clientele. The speakers and participants pose for a souvenir photo. The UST Miguel de Benavides Library in partnership with the CE-Logic Company organized a seminar-workshop on Library Services as Signifiers of Excellence on February 21-22, 2019, held at the UST Library Conference Hall. It aimed to discuss the trends and technologies in the field of librarianship. 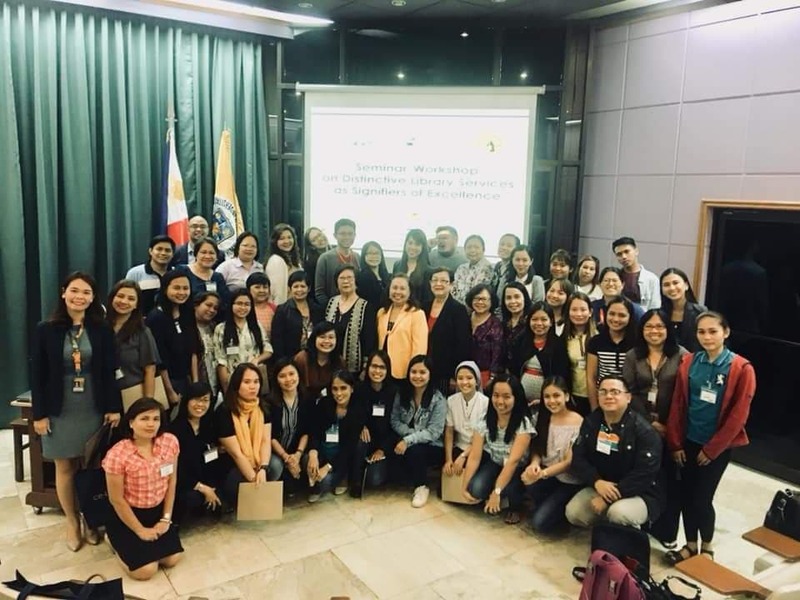 It was an accredited Continuing Professional Development (CPD) program with 14 CPD credit units and attended by selected UST Librarians, alumni, and other off-campus librarians. Fr. Angel Aparicio, O.P., Prefect of Libraries, in his opening remarks said that there are two places in the UST campus that he can call a sanctuary: The Chapel where students soothe and nourish their spirit, and the Library where they nurture their minds. He welcomed the group with the feeling of joy as they participated in the seminar despite their hectic schedules. The invited speakers were the executives of InfoManagement Specialists, Inc. (IMSI), namely, Prof. Salvacion Arlante, chairman and Ms. Fides Abad, director. Prof. Arlante was also the former University Librarian of the University of the Philippines, Diliman, Quezon City while Ms. Abad was the former archives head of Xavier School, San Juan, Manila. Both of them are retired librarians and are recognized by their invaluable contributions in the librarianship profession. Also, present in the seminar were Ms. Prudenciana C. Cruz, former director of the National Library of the Philippines and the current Head Execon of the National Committee for Library and Information Services - National Commission for Culture and the Arts, and secretariat of IMSI, and Ms. Rosemarie Rosali, another secretariat of IMSI. The session started with a talk on Influences Affecting Trends in Librarianship by Ms. Abad. She tackled the environmental influences affecting the delivery of information, and various library user’s needs. 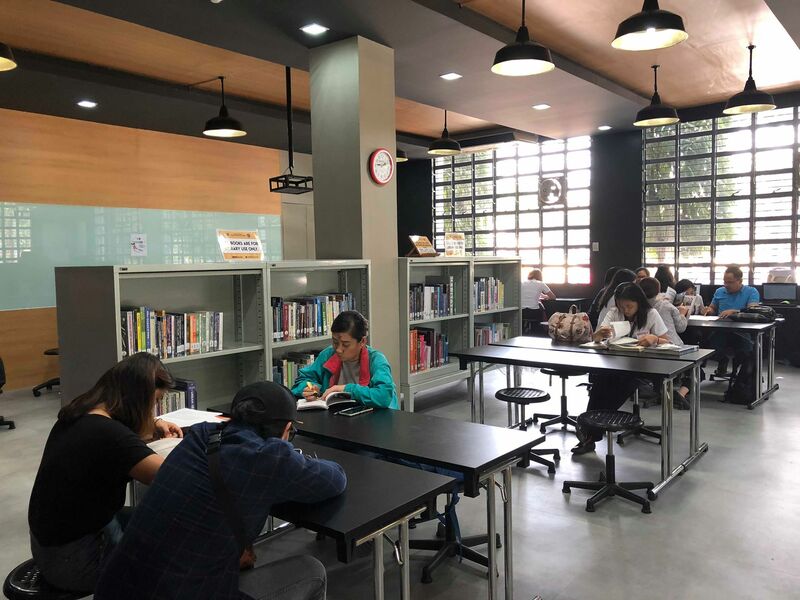 She reiterated that the Library now should be considered as “the third place,” which supports not only the quiet study but social study and just general socialization. She also pointed out that librarians, nowadays ought to be guides and facilitators of information who understand patron demands and are flexible to technological change to deliver effective library service and satisfy users’ needs. The second lecture, Learning Resources and Digital Management was delivered by Prof. Arlante. According to her, the new information and communication technologies have greatly influenced the Library and its management and services. With the rapid technological changes, academic institutions, educators and learners are utilizing electronic/digital tools to support learning. Thus, having a hybrid library which has both physical and digital collections is essential nowadays. 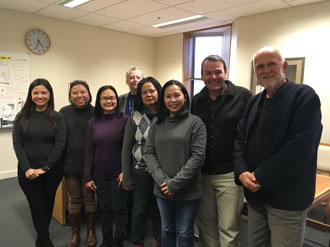 Then, presentation and hands-on trial on how to use and access some library databases which are being offered by CE-Logic were completed in the afternoon session. Afterward, a tour to the UST Library was carried out only to those who were interested in joining. The interested participants were divided into three groups based on their chosen area of interest (Heritage Library, Reference Area and Services, and Technical Section). The topic Competencies of Librarians for the 21st-century Clientele was delivered by Ms. Abad in which she emphasized that managerial effectiveness, personal attributes, and interpersonal effectiveness must be possessed by the librarians to stay relevant. Prof. Arlante discussed the Librarians and Office Staff Productivity and Leadership. She said that it is the responsibility of library and office management (leadership) to discover the potential in each librarian and office staff and to apply the appropriate motivational strategy to increase productivity. She added that effective transformational leaders are necessary to embrace change and to move library organizations forward. Lastly, Prof. Arlante talked about the Librarianship Towards Continual Professional Development. The continuing education program is necessary to sustain professional skills and knowledge. The seminar-workshop was, indeed, enlightening and engaging due to the interesting topics and exciting group learning activities undertaken. Libraries are always evolving. To remain relevant to their customers, it must continuously examine ways to meet the evolving needs of its users. At present, libraries tend to be always under pressure to create space. Space for active learning, social collaboration, and new services. As the new academic year opened, a newly converted General Reference & Information Section (GenRef Section) welcomed its patrons. It transformed into a flexible learning space for information technology, collaborations, reading or study. Colorful tables, chairs, as well as, comfortable and inviting bean bags are placed in the area now known as the “Learning Commons.” Some electrical outlets are installed for charging needs of library users in relation with their academic requirement. Moreover, the gadget corner that was previously located adjacent to the General Circulation Section was transferred to this area to provide a more engaging facility for learning. Also, two Android tablets are waiting to be installed for the use of library patrons for easy access to the library’s electronic resources. The GenRef Section collections which mainly comprises of printed encyclopedias, dictionaries, yearbooks, almanacs, manuals, etc. were transferred to an area next to the Old Books Section located at the ground floor of the library. On the other hand, the map collection is now in its new multi-deck rack found at the GenRef Section. The transformed library space aims to bring together both the traditional and modern libraries by providing flexible spaces, thus, serving multiple purposes as a place for an individual study and an ideal venue for interaction and collaboration..
An academic library becomes effective when it meets its purpose of providing relevant information resources and quality services to meet and satisfy its users’ needs. The library, being the heart of the university, serves a vital role in the learning experience of its patrons. They say that a library that is not being utilized is as good as dead as it cannot justify its existence. Its continued relevance depends on the effective utilization of its resources and services, as well as, satisfaction from its users. Amidst the changing role of libraries, the UST Miguel de Benavides Library continues to play its role by effectively providing relevant resources and delivering quality services. Last academic year 2017-2018, the library’s utilization was clearly manifested by the following data: there were 10,948,882 access to electronic resources remotely (excluding access from within the university); 129,493 views of the Digital Library collection; 8,756 printed books were acquired; 84,520 books were borrowed or checked out; 113,398 books and 7,900 printed journals were room used; 34,522 books and 6,214 times journals were photocopied; 97 library orientations and 202 database tutorials were conducted; 4,014 times the library’s discussion rooms were used; 213 document delivery requests were fulfilled; 32 library tours were facilitated; 29 use of facility requests were granted (conference hall); and over 950,000, visitors have walked through the library’s doors. 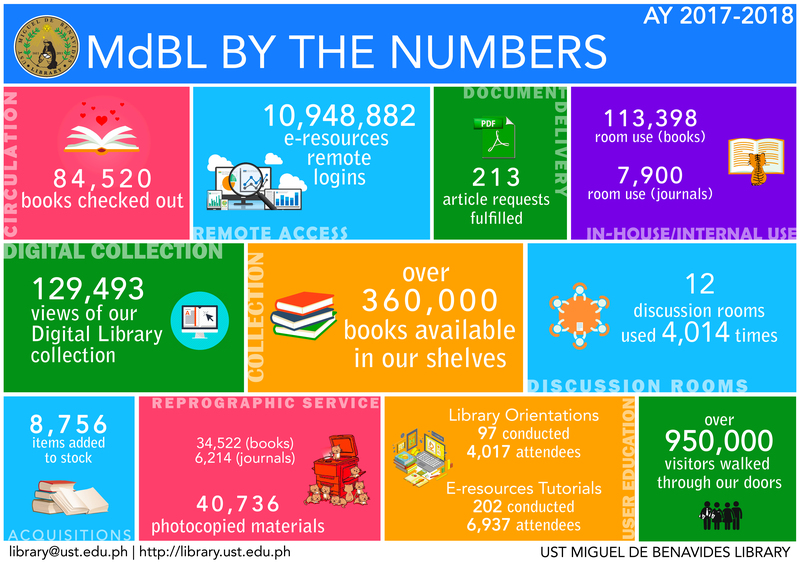 Certainly, these numbers prove the very essence of the UST Miguel de Benavides Library’s existence. Last September 29, 2017, the UST Library Administrators, Fr. Angel Aparicio, O.P., Prefect of Libraries, Ms. Estrella Majuelo, former chief librarian, and Ms. Ma. Cecilia Lobo, former assistant chief librarian, (and the current chief librarian of the UST Library) flew to Davao for the signing of the Deed of Donation and turn-over of the personal collections of the late Erlinda A. Pichon, a Thomasian from Caraga, Davao Oriental. The donation contains books, postcards, photographs, paper ephemera and glass slides. The signing was held at Café Amoree, Davao City wherein Erlinda A. Pichon (donor) represented by Expedito Pichon and University of Santo Tomas (donee) represented by Fr. Aparicio on behalf of Rev. Fr. Herminio Dagohoy, O.P., Rector, signed the deed in the presence of Ms. Majuelo, Ms. Lobo and Ms. Leticia Pichon Militante. Ms. E. Pichon is a co-founder of a non-profit Amauan Multi-Arts Workshop in New York City which operated from 1978 to 1998. In her service of two decades as Amauan’s unpaid director, she was honored at the Malacañang Palace as an Outstanding Overseas Filipino. During much of this time, she was a social worker and supervisor of the New York City Human Resource Administration. Mr. E. Pichon (left) and Fr. 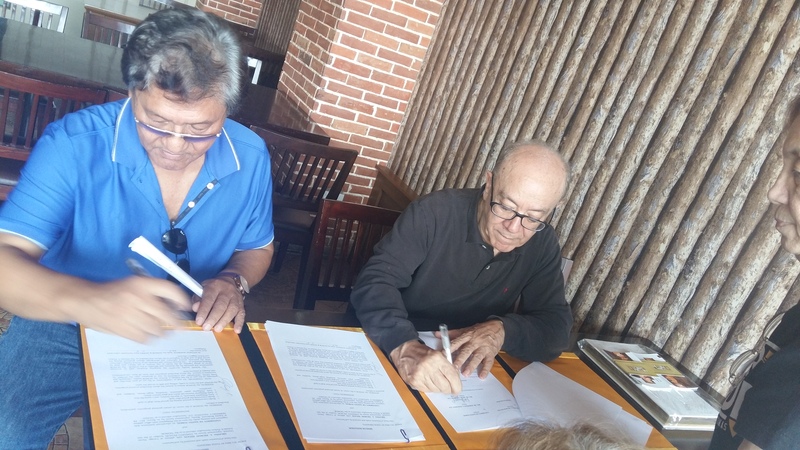 Aparicio (right) as they sign the Deed of Donation. On October 1, 2014, the Library procured a fairly large number of print and research materials about 400 volumes, courtesy of Mr. Thomas B. Colvin. Mr. Colvin, an American businessman, researcher and historian, generously donated his personal collection of books, several important documents and research articles and other materials. His research interests include maritime history, background and history of countries like Mexico, Macau, Spain and all aspects relating to the Balmis expedition, which details the campaign of Dr. Francisco de Balmis of vaccination against small pox and the introduction of the vaccine in Spain’s colonies including Cuba, Mexico and the Philippines. 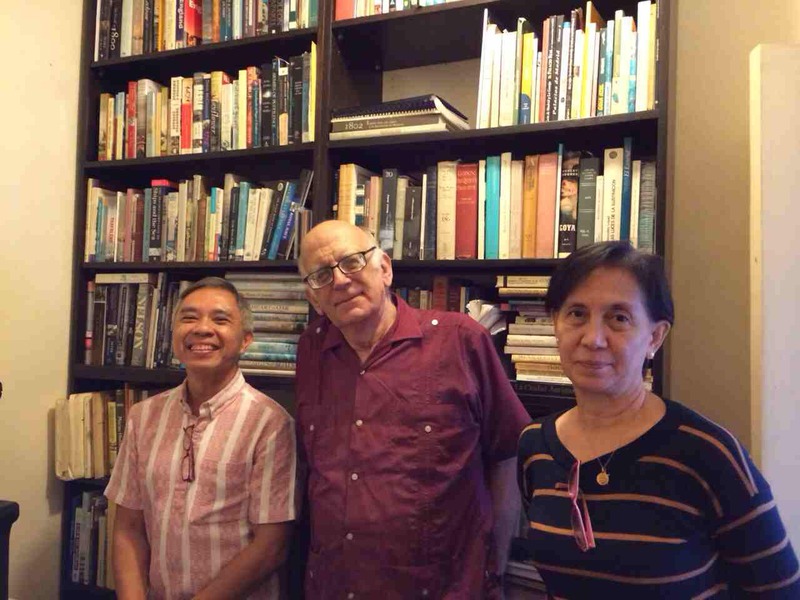 (L-R) Prof. Regalado Trota Jose, UST Archivist, Mr. Colvin and Ms. Estrella Majuelo, former Chief Librarian. The collections of the late Ms. E. Pichon and Mr. Colvin are housed at the Antonio Vivencio del Rosario UST Heritage Library. The UST Miguel de Benavides Library expresses its heartfelt gratitude to its library benefactors for their kindness and generosity. 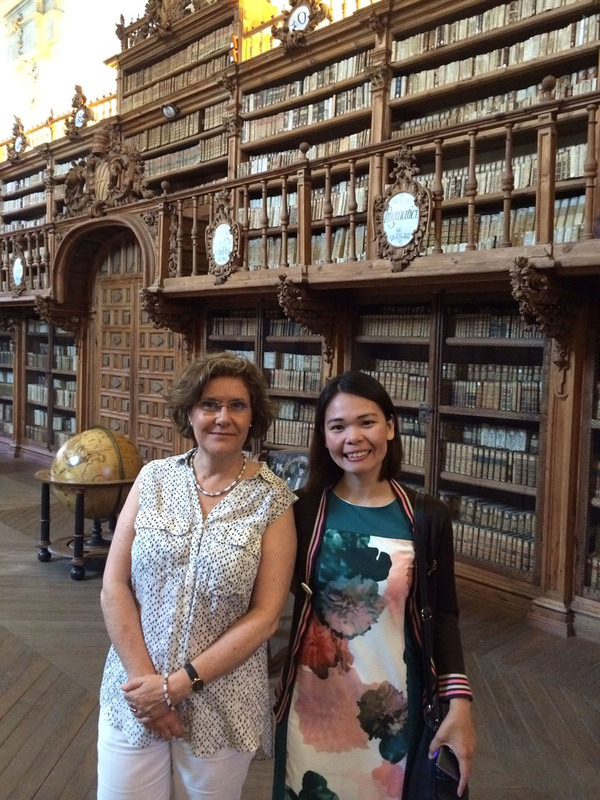 The UST Library and the UnionBank of the Philippines through its partnership program Lumina Pandit sent Ms. Diana Padilla, head librarian of the UST Heritage Library, to Spain last June 1, 2017. The objective was to explore historical libraries and archives and to discover the best practices specifically on the preservation of its rich historical materials and other aspects in rare books library management. The activity lasted until July 13, 2017. 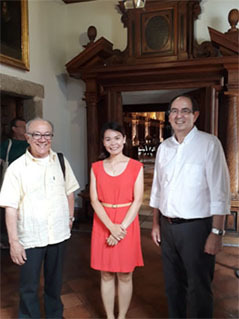 Ms. Padilla visited the following Institutions: Biblioteca Nacional de España (Madrid), Biblioteca Historica Marques de Valdecilla – Biblioteca de la Universidad Complutense de Madrid, Real Biblioteca del Monasterio de San Lorenzo de El Escorial, Biblioteca de AECID (Agencia Española de Cooperación Internacional para el Desarrollo), Biblioteca Universidad Carlos III de Madrid, Archivo Franciscano y Ibero Oriental (Madrid), Consejo Superior de Investigaciones Científicas - CSIC (Madrid), Real Monasterio de Santo Tomas (Avila), Convento de los Augustinos Filipinos (Valladolid), Convento de San Esteban (Salamanca), Biblioteca General Historica de Universidad de Salamanca, Biblioteca Museu Victor Balaguer (Barcelona), Biblioteca de Reserva de la Universitat de Barcelona, Taller Restauració and Centre de Digitalització (Universitat de Barcelona). 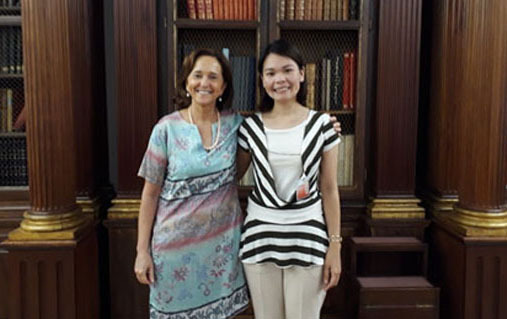 This activity allowed Ms. Padilla to meet, exchange ideas and share work experiences with the librarians who, like her, are in-charge of the historical collections. She said that all the directors, librarians, and archivists whom she encountered exude profound passion and commitment in their field. She realized that the existence of the nation’s history greatly depends on the librarian’s care, to ensure that the knowledge and wisdom embedded in those historical collections continuously radiate for future generations; a mission to be zealously fulfilled by committed librarians through centuries. 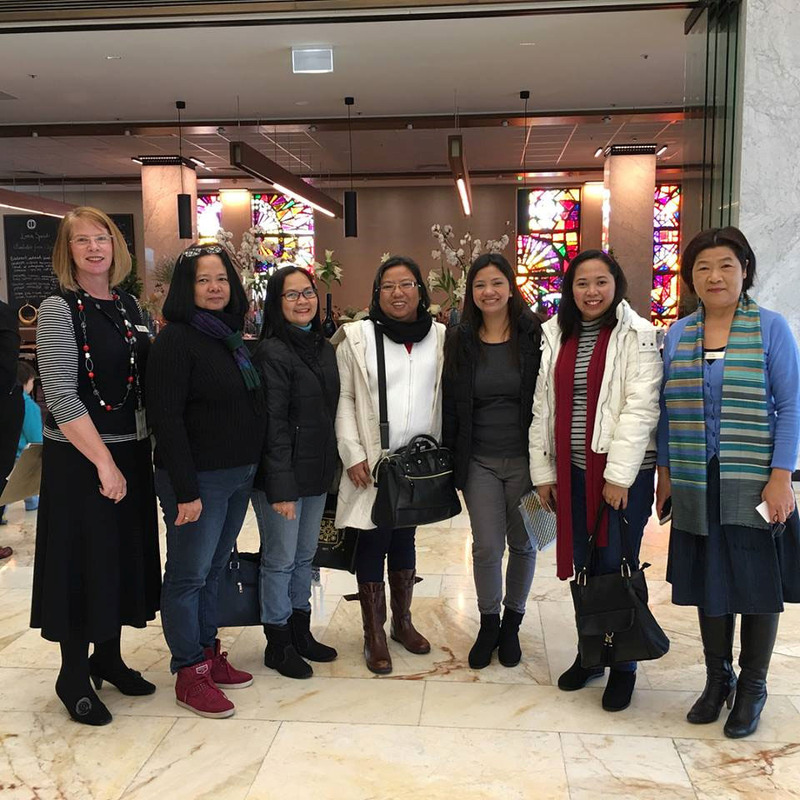 Likewise, the UST Library sent another five librarians to benchmark in Sydney and Canberra, Australia. They were: Ma. Cecilia Lobo, assistant chief librarian; Juanita Subaldo, head librarian, Humanities section; Rosemary Balbin, librarian of the Gifts & Exchange; Lourdes Fatima Ramos, head librarian, Junior High School Library; and Kristi Ma. Fevie Macasaet, assistant head librarian of the Science and Technology section. The activity started on June 29 until July 3, 2017. They benchmarked on the areas that concern the library in general such as: improvement of its services and facilities, development of library marketing and promotional activities, professional growth of the staff, and adapting trends in library technology. 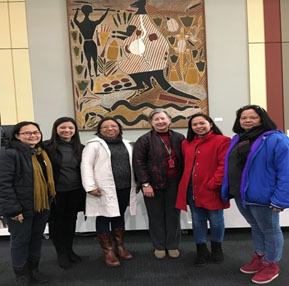 The group visited the National Library of Australia, University of Canberra Library, The Australian National University Library, University of Sydney Library, and Macquarie University Library. After their trip, several projects and activities have already been proposed to improve the UST Library’s services. These worthwhile professional endeavors would not have been possible without the support of the University Administrators, Office of the Vice-Rector for Academic Affairs, Office of International Relations and Programs, Library Administrators, and cooperation of the libraries and archives that the librarians have benchmarked with in Spain and Australia. Gratitude goes also to the UnionBank of the Philippines for supporting the travel of Ms. Padilla.